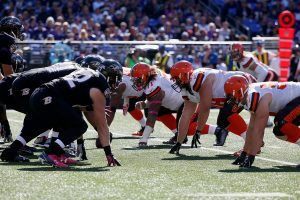 Fans keep complaining about the low level of games shown on NFL Thursday Night and unfortunately action this week will be between the Cleveland Browns and the Baltimore Ravens at the M&T Bank Stadium in Baltimore a game that doesn’t promise much. As things stand right now this should be a no brainer bet since Browns have still to win a game this season, but remember that the last time these two met, the Browns actually opened the score and took the lead in a game that ended with a close score 25-20 in favor of the Ravens, so perhaps it’s hard to think this Thursday night game will be the first win for the Browns, but the question when it comes to betting on the Browns vs. Ravens game is if the Ravens will cover the spread. Yes, we do not expect to see a high action game, but, betting always adds excitement to any match, so head over to AceSportsbook.com and place your bets on NFL (totals, halves, props and Live betting), keep in mind that on Thursdays there is NO JUICE on the entire NFL board. Cleveland is currently a hurtful 0-9, their last loss came against a very superior Dallas Cowboys on Sunday when they lost 10-35. Cleveland is averaging only 18.7 points per game and allowing 30.3 points per match. QB Cody Kessler played again this past Sunday and he is likely to start on Thursday, he has been doing an OK job, on Sunday he was 19 of 27 completions for 203 yards, he was also sacked four times… the problem with the Browns is not the QB… is many different little things that still need to fall in place, for instance the protection of their QB; wide receiver Corey Coleman is also back and had 3 catches in 7 targets in 41 yards. Their run game needs work as they only rushed 45 yards against Dallas. One can’t help but wonder what’s the Browns’ mind set right now, motivated and ready to try and get at least this one win for their honor… or is their spirit crushed and frustration has taken over. Ravens haven’t had a great season either, standing currently with 4 wins and 4 losses; their last game was on Sunday when they finally got another win defeating Pittsburgh 21-14. Quarterback Joe Flacco hasn’t been at the top of his game, but he has received assistance from his team, which has kept them afloat. Baltimore averages 19.2 points per game and is conceding 19.1. If the Ravens’ defense looks anything like they did against Steelers, the Browns don’t stand a chance. The line opened at -11 for the Ravens, and some sportsbooks already have it at -9.5 while the total seats at 45. The Ravens have everything going for them in this game and should win the match. For those that want to go for the money line, they’d have to lay -625 on Baltimore… taking Browns +10 might be tempting for some, I do believe the score will be close, but Ravens need this win and they are playing at home, therefore I’ll give it another day and will try to get the football gambling line at -9 or -8.5 for the Ravens.